Duravis R 630 is an economical and durable tyre from Bridgestone. The ideal wet performer is the best match for light trucks and vans. For long lasting tread life and passenger safety, the tyre is designed with Super LL Carbon compound. The first class tread pattern with deep grooves and Z shaped sipes provides extra traction on wet roads. For increased stability and driving comfort, the tyre is manufactured with wide contact patch with circumferential grooves. With sidewall protecting ribs and jointless cap layer, it is a robust tyre which can face even the most rugged roads. 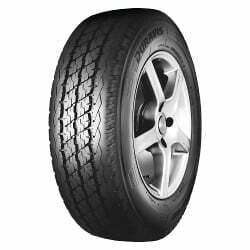 30% more mileage than any other tyre of its kind, Bridgestone Duravis R 630 is an excellent and classy player on both wet and dry condition with enhanced grip and safety.